The methodology of the EU Support to Democratic Governance in Nigeria, Component 1: Support to the Independent National Electoral Commission (INEC) is based on the European Response to Electoral Cycle Support Strategy (EURESC) jointly designed by the European Centre for Electoral Support (ECES) and European Partnership for Democracy (EPD). Consistent with European values and EU policies, EURECS adopts an inclusive approach towards a wide range of electoral stakeholders to ensure comprehensive and sustainable actions, and it is built to prevent, mitigate and manage electoral related conflicts in line with international standards and obligations. 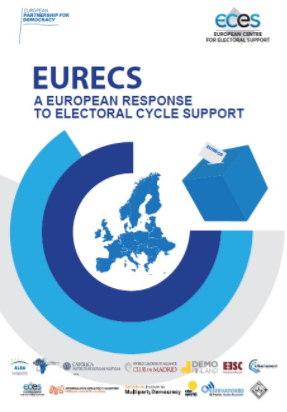 ECES’ methodology also relies on the Electoral Cycle Approach (ECA), which was crafted as a response to the lack of a coherent methodology for electoral assistance paying due attention to the inter-election period and assessing local dynamics through electoral political analysis. The ECA approach allows for a more targeted identification of needs and advanced planning aimed at improving the overall coherence and complementarities of the actions. Furthermore, project’s methodology includes the Electoral Political Economy Analysis, which provides an analytical framework to identify underlying factors, frameworks (both formal and informal) and dynamics that shape stakeholders’ perceptions, motivations, values and ideas in relation to electoral processes. The objective of EPEA is to suggest the most influential constraints and opportunities facing a defined question of concern with a view to promoting stability and lasting democratic development. With regards to capacity building activities, the Project has built-in mechanisms to ensure strong ownership and designed to strengthen already existing skill-sets while building new capacities where gaps are emerging. A multidimensional gender strategy that engenders men and women as more multi-facetted than being one homogenous group will be adopted.